The province of Guanacaste (a prime area) lies in the dry, Northern Pacific region of Costa Rica. It has a beautiful landscape of mountains and volcanoes, verdant forests, vast plains, and beautiful shores. The mountain ranges of Tilaran and Guanacaste and volcano summits are popular hiking destinations, while the Rio Tempisque allows kayak and canoe trips. The thick forests, which are home to exotic plants and endangered bird and animal species such as jaguars and tapirs, are areas of exploration for adventurers. Ranking first among Guanacaste’s destinations, though, are the fishing villages that have been turned into modern beach towns. Each town has its own culture and crowd, and varied attractions. The surfing beach town of Tamarindo has a lively nightlife. Expats run many of the hotels, restaurants, and bars in the area. The small and pretty Playa Hermosa has some fine hotels and nice gated communities. Playas del Coco, which is the oldest fishing village in the province, has world-class scuba diving sites. The bird-watchers’ paradise Golfo de Papagayo has all-inclusive resorts and luxury hotels. The peaceful Playa Ocotal also has nice resorts and pretty villas. Guanacaste’s capital, Liberia, is the gateway to the province’s beach towns. It boasts the historic road Calle Real, which has a quaint display of old colonial architecture. The cool and fun-loving beach town of Tamarindo attracts local and foreign surfers. It is the most developed town in Guanacaste, in terms of tourist infrastructure. Tamarindo is very cosmopolitan, with a residential community consisting of foreigners from different parts of the world. Its diversity is quite unrivalled by other beach towns. Tamarindo, which was once a fishing village, offers many activities on the water: surfing, windsurfing, snorkelling, sailing, jet skiing, and scuba diving. Sport fishers come here for the tuna and marlin. Las Baulas National Park protects endangered leatherback turtles. Golfers play at the well-designed Hacienda Pinilla course. 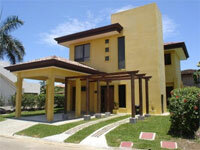 Hacienda Pinilla is both a beach resort and a gated residential community. It also has tennis courts, restaurants, surf spots, and stables. Palma de Tamarindo is a luxurious residential community with two- and three-bedroom condominium units. The hotels, restaurants, bars, discos, and shops along the main road are mostly foreign-owned. Tamarindo also has markets, bakeries, pottery and craft stores, a spa, and an art gallery. Owing to the town’s popularity, there are many houses and condominiums for rent or sale at high prices. Playa Hermosa in Guanacaste—not to be confused with Playa Hermosa in Puntarenas, which is a surfing beach—proudly carries the Blue Flag distinction that is awarded to clean, environmentally sound beaches. The two-kilometre grey volcanic sand beach is surrounded by tropical forests. Playa Hermosa enjoys warm sun and cool breezes. It is a top choice of families, as it is ideal for sunbathing, swimming, and snorkelling. Playa Hermosa has excellent hotels, fine restaurants, a few bars, three golf courses, mini-marts, a school, and a church. Playa Hermosa is one of a number of popular beaches in the area: Playas del Coco, Playa Ocotal, and Playa Panama. Its residential community consists of expats and locals. There are many ocean-view lots on offer here, including lovely villas in Hermosa Heights behind the beach. Playa del Coco, one of Guanacaste’s most developed and well-known beach towns, manages to retain its charming fishing-village appeal. Its deep cove, surrounded by green hills and steep cliffs, has calm, turquoise waters safe for swimming. Golfo de Papagayo, named for the parrots that inhabit the peninsula, continues to be a sanctuary for tropical birds such as macaws, despite the steady rise of commercial and residential developments in the area. All-inclusive, world-class beach resorts, boutique hotels, and luxury villas dominate the beautiful beaches. Golfo de Papagayo is near the national park Rincon de la Vieja, which has four volcanoes surrounded by thick forests. Exclusive planned communities are found in the elevated areas, which give residents panoramic views of the gulf and the Pacific. Mid-price to luxury villa properties are available. Inshore fishing is a popular activity here. Local fishermen in the quiet Playa Ocotal and the more active Playas del Coco charter trips. Guanacaste’s capital became one of Costa Rica’s top transportation hubs for tourists when its Daniel Oduber Quirós International Airport opened. The capital, founded in 1769, retains a strong colonial vibe. Old adobe homes with red-tile roofs and large shuttered windows line its narrow streets. The central plaza, though small, is quite pretty, and is a local gathering place. Liberia is actually referred to as the “white city” for its prominent whitewashed buildings. Residential properties in Liberia include condominiums, large homes in gated communities, and beachfront and ocean-view properties. Prices depend on location.